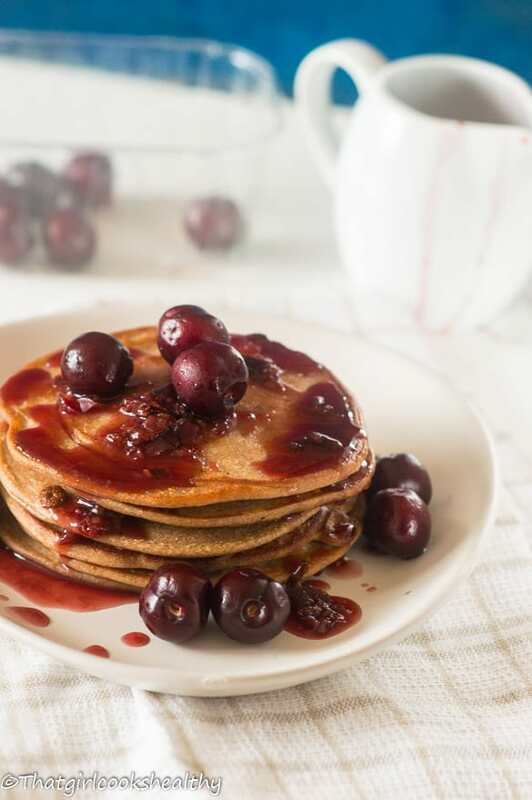 Vegan blender pancakes – made with a combination of quinoa, almond and coconut flour this egg free pancakes are incredibly delicious. I don’t know why but as of lately I have been craving some vegan blender pancakes. I didn’t grow up consuming them and to be frank pancakes aren’t exactly something I eat on a regular basis anyway.I’m partial to having them during the month of February, namely because of Shoves Tuesday. I blame our American counterparts for introducing the Brits to this breakfast dish. Now granted I am dairy free BUT not a vegan, I find myself having to make this clear especially with my blog’s niche as dairy free doesn’t equate to going meat free. I am dairy free because I am lactose intolerant and occasionally eat meat, though I’m slowly researching the benefits of transitioning to a alkaline/plant based diet. 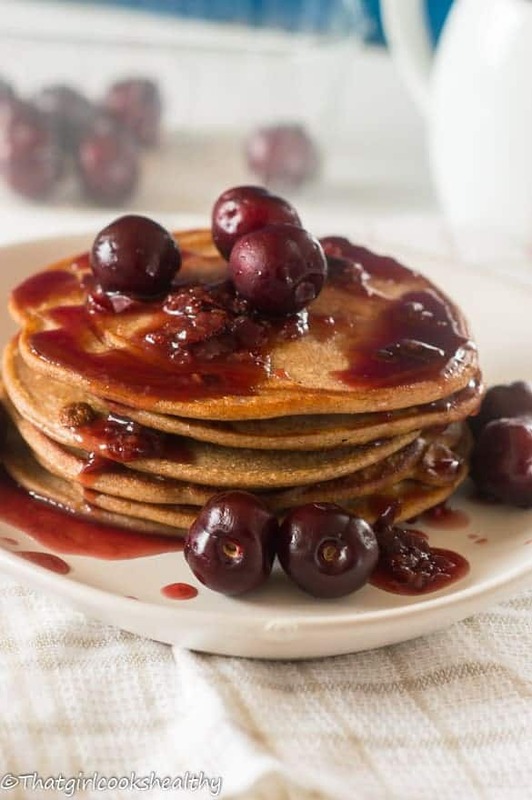 What you should make these vegan blender pancakes? made with coconut milk making them dairy free. 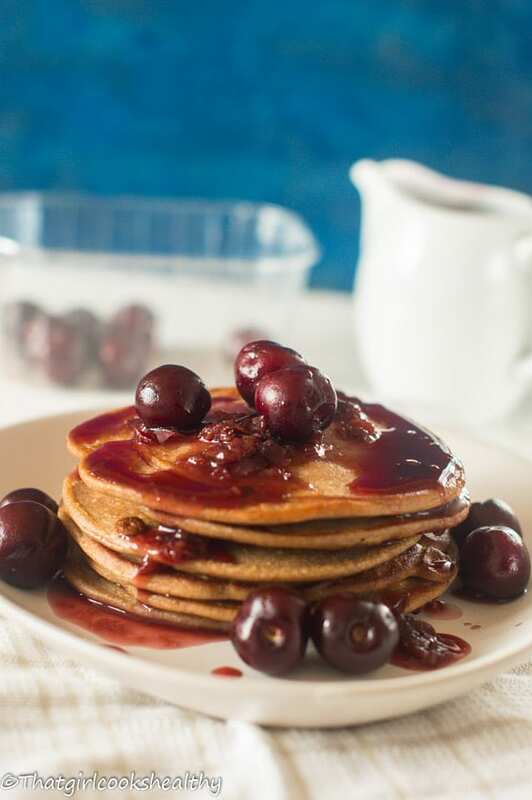 These pancakes taste amazing without the use of gluten and dairy. Most of the prep work is done in the blender hence the name of recipe. I whipped up a batch of six and subsequently ate them all. I shocked myself in terms of the taste, didn’t think I would like them without the egg but it turns out they are equally as nice and it reduces the cost by omitting eggs. 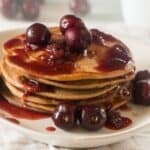 How to make the vegan blender pancakes without eggs? I managed to successfully build the structure of the pancakes using flax eggs (flaxseeds mixed in water). Flaxseeds are great for creating the binding element that eggs tend to do, only a vegan version instead. The key ingredients for the flour blend are quinoa flour, a light gluten free, high protein flour. Quinoa flour does have an acquired taste so blending it is ideal if you can’t bear how potent the taste is. Ground almonds helped to balance out the strong after taste of quinoa along with the tapioca flour. You can really be creative with pancake toppings. I’m quite partial to fruit based topping, a great example of a sweet fruit topping is this raspberry compote who doesn’t like a bit of raspberry on their pancakes? You will notice I didn’t include Xantham gum, that’s because both the tapioca and flax eggs did a tremendous job at binding the batter so well. I made the flax eggs first and set them aside before adding everything to the blender. This is a lazy method of preparing batter, yes I know! Reserve the judgement for another time BUT…..the blender technique speeds things up and reduce mixing everything in separate bowls. Prepare the flax eggs by mixing the ground flaxseed with the water. Whisk together in a small bowl and set aside. The mixture will begin to congeal and thicken unattended. In a high speed blender add the coconut milk followed by the remaining ingredients including the flax eggs and blend into a smooth lumpless batter. Heat a crepe pan or skillet with coconut oil, and ladle the batter onto the chosen pan. Use a egg spatula to turn over the pancake when the first side is cooked. Repeat this step with the other side. Repeat step 3 and 4 to make pancakes with the rest of the batter. I love how easy it is to make our favourite foods vegan. 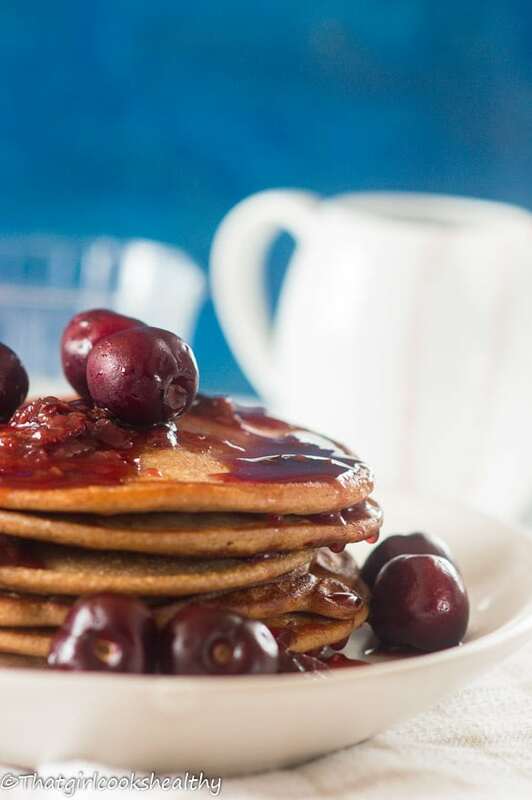 Love the cherries on these pancakes. How great to have a dairy free alternative to buttermilk pancakes. Dietary problems are only becoming more and more common so even if one isn’t dairy free, gluten free etc etc for personal reasons, often friends and family are. It’s great to have recipes which can feed everyone in the room and not leave anyone feeling left out. These look delish and I love cherry anything! Hi there Jo, yes allergies and intolerance to foods is commonplace now with more people seeking alternative options. It’s great when you whip up a recipe that literally caters for ALL palates. It’s a win win situation! These look great. Always good to have a few vegan recipes on hand for my vegan friends! Thanks for this! I’ve got a great vegan friend that I really like… but usually never know what to cook him so I’m sure I don’t invite him over often enough to have dinner with us as a result! At least I now know what I’m making him for dessert the next time he visits! These pancakes look delicious. Yes! Cooking for vegans is a challenge within itself. I’m trying to explore more vegan cuisines as of lately, so far so good. These look awesome and i love that they are vegan! I have never worked with quinoa flour yet, but your recipe looks so creative and yummy! Thank you. This was my first time too and I as slightly apprehensive but the results were surprisingly good.